yeah, that was not bad at all. then there was the time when he discovered books. oh, he devoured them! yeah, well, those days are SO over! one day last week, he was a little hellion all day. finally, i told him he had to stay in his room and play while i went and recovered on the couch. all was fine for a while until i heard the bathroom door shut. i got up, went down the hallway and opened the bathroom door to find.....t.w. at the sink sucking down his toothpaste from the tube!!!!! unfortunately, i don't have a picture of that, since he was mightily and speedily sent back to his room! 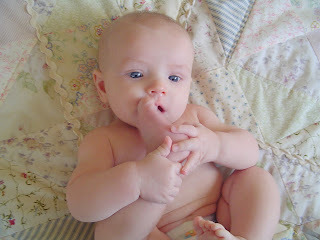 Ah, toes, quite tasty. But, books, devouring books, a good habit. One he comes by naturally, I would think.